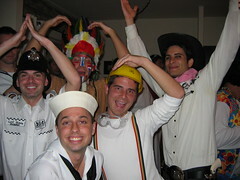 The Gay High Holy Days have arrived, and in particularly queer fashion, my friends and I all got dressed up in our Sunday Saturday night best for a party. Oh lordie what a fun time we had! 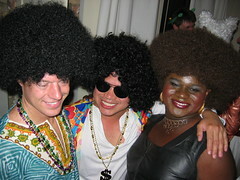 Oddly enough, only two weeks ago, I was not aware of a single Halloween party to attend, and neither was anyone else. I mentioned this to my friend Jeremy, who has become somewhat of a social director for our group of friends (even though sometimes I think he’d rather if someone else took the lead! ), and he said that he, too, was not planning on going anywhere for any type of party. Seeing that this was ridiculous (who in their right mind doesn’t go to a Halloween party? I mean really! 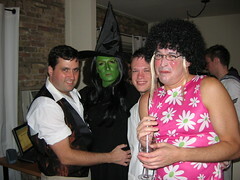 ), Jeremy and I decided that Jason, who lives right in the heart of Boystown, should host the party. Now granted, this is before anyone had actually contacted Jason or asked him if it was alright, but we knew Jason, and we knew that he’d jump at the chance. He did. The Murder Mystery party was fun. I barely made it in time from work (which has been a BEAR lately), so I barely had time to get into my character. Everyone else was dressed for their parts. The story was set in the old west, and I was supposed to be a rich land developer who wanted to buy the saloon where the mystery was being held. I showed up in a sweater and jeans. So they had to imagine… big deal. So when Saturday arrived, I had to get my costume ready. I didn’t spend a dime on the outfit. 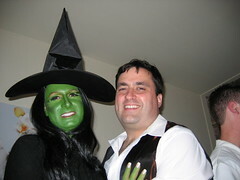 Since Jeremy wanted to go as as Elphaba, the Wicked Witch of the West from Wicked. I, being not-so-terribly creative with costuming (and not wanting to go terribly overboard) decided to dress as Fiyero, Elphaba’s love interest from the same show. I had a vest in my closet that was perfect… I had plenty of white dress shirts and khaki’s, and I had a green wool blazer that I dressed up as a military jacket with some full-page labels and Adobe Illustrator. Clever, cheap, and I was out the door. The pictures tell the story. There were some pretty creative costumes among us all… and some really outrageous ones as well. The drinks were flowing heavily and, although I don’t like to drink that much, I did have myself a bit more fun than usual. We ended up at a bar afterwards but I dragged myself into a cab after only about 1/2 hour.